I just Googled the phrase “goal setting”, and found approximately 3,600,000 web pages that relate in some way to that phrase. This shouldn’t surprise us, because conventional wisdom is that goal setting is an important skill. It is easy to document both through anecdotal evidence as well as through research that setting goals can help us achieve more. There are hundreds of books, tapes, speeches, workshops, and websites that will provide us with tools and processes to set goals. One would think for something as important as goal setting, with as many tools as there are available, that everyone would be a goal setter. This however isn’t the case. While I could fill a book with the reasons why, there is one that is very important. People don’t set goals now because they didn’t achieve the ones they set in the past. They’ve followed the goal setting process they learned or read about, but the seminar or book stopped at the wrong time. The seminar stopped with the setting of the goal. That is like ending the game after the first play, then going to sit on the sidelines, while the goal is out on the playing field. My advice to you, if you can identify with what you’ve just read is to stop worrying about goal setting. And start focusing on goal achieving. In other words, stop worrying about which goal setting model to use, or which software to track your progress with. Stop making the goal setting process the focus, and start putting the focus on goal achievement. 1. Get sick and tired. It is often said that people really begin to reach new health goals when they become “sick and tired of being sick and tired.” Achieving a goal means that you want something different than you have now. To build your ongoing and sustaining drive to achieve the new item, knowledge or situation, you must become disgusted and dissatisfied with the current situation. This doesn’t mean that you should become bitter or grumpy, but rather it means to develop a healthy dissatisfaction with the way things are now (current profitability, the cycle time for new product development, or your inability to find a bathroom in Brazil). 2. Get (and stay) excited about the result. To sustain the challenges, setbacks and disappointments along your way to goal achievement, you must have another motivation as well. You must really want the benefits that will come to you when the new goal is achieved. Build a clear and compelling picture in your mind of what you will feel, sense, see, and believe once your goal has been achieved. Focus on the results you will gain from the goal, rather than just the goal itself. This is important because in the end this is what you are after, not “just” the goal itself. 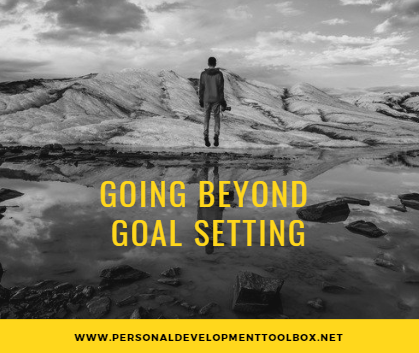 As you work towards your goal, the goal might shift, but as long as the desired results remain clear, you have improved the likelihood of achieving the end result you desire. 3. Start a plan and get started. Notice I didn’t say to lay out a complete plan of all the steps between you and your goal. If your goal is of any size and importance at all, it will require many steps, and it will be very difficult/impossible to identify them with any degree of certainty at the start. Too many people think they need the perfect plan. They delay starting so they can get the best information. They want to talk to one more expert, read one more book, examine two more options. Get started already! Give yourself a clear idea of a general approach, and some clear first steps. Allow yourself the luxury of knowing that the next specific steps will become clear as you stay on the path. Doing these three things will drastically increase your success in achieving any goal you set. Actually, let me say it more strongly. Until you have these three factors going for you in large (although potentially varying) amounts, you won’t achieve the goals you set. You will lose momentum. You will lose focus. You will lose hope. You won’t be able to overcome the first setback. And you will fall into the convenient and comfortable thinking that goal setting “doesn’t work” for you or that you need a new tool, a new technique or a new guru to help you set “better” goals. Whether you are setting goals for yourself, the team you lead or for your organization at large, take this advice to heart. Focus less energy on setting the perfect goal and spend more time preparing yourself for ultimate success. Stop worrying about the resolution, and start focusing on the resolve that will be required to succeed. Doing this will bring you greater success, less frustration and will help you and your organization move closer and closer to your potential.